Vitamin B12: important nutrient combinations. 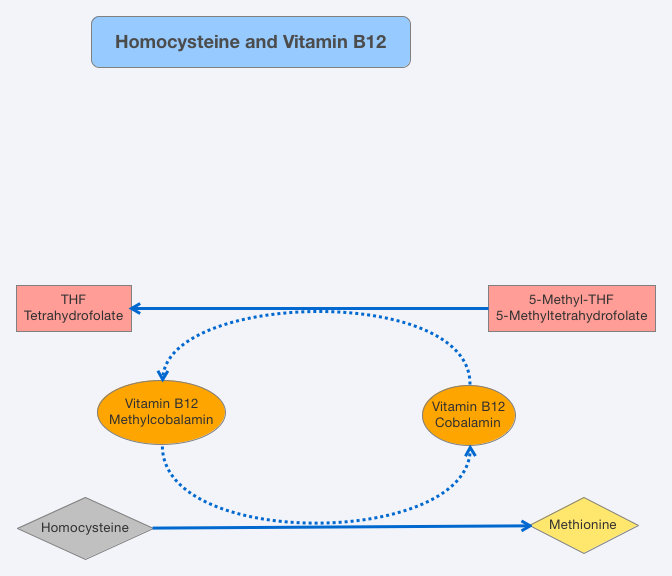 Interrelations between B12 and other micronutrients. Balance B12 with folic acid, calcium, biotin, magnesium. Our metabolism is a complex system of continuous and interlocking processes. Here, no nutrients works alone; to take effect, each element relies on interactions with numerous other components. The same is true of vitamin B12. Whilst many diseases and medicines negatively affect vitamin B12’s beneficial workings, there are other specific nutrients (i.e. cofactors) that support its function, or even enable it in the first place. 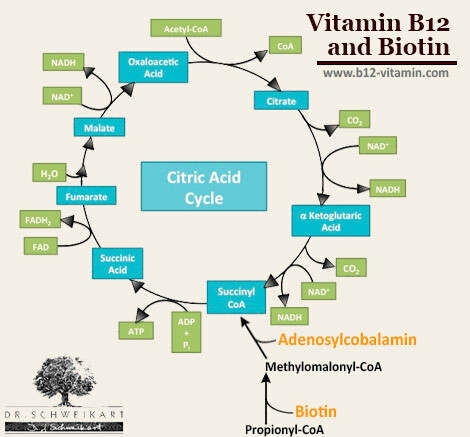 This article will give an overview of these interactions and will provide options for useful nutrient combinations when undergoing vitamin B12 treatment, as well as for general health. As the article Vitamin B12 and Folic Acid explores in detail, folic acid is the closest direct ‘partner’ of vitamin B12. After various reactions, B12 converts folic acid back into its bioactive form – in other words, the former reactivates the latter. Without vitamin B12, the body quickly suffers from a functional folic acid deficiency, since any folic acid in the body gets stuck in its unusable form. Although there is clearly enough folic acid present, it cannot be utilised. On the other hand, vitamin B12 also depends on folic acid: in the corresponding reaction, folic acid (more specifically methyltetrahydrofolate) gives off a methyl group for vitamin B12, causing the latter to react. The vitamin B12 form of methylcobalamin later passes on the methyl group to homocysteine, whereby it is converted into methionine. Vitamin B12 and folic acid are directly dependent on one another in this reaction; the reaction can only take place if both reactive partners are present. In spite of this, folic acid deficiency is one of the most common forms of vitamin deficiency. The second bioactive form of vitamin B12, adenosylcobalamin, requires biotin (also known as vitamin B7 or vitamin H) and magnesium, in order to fulfil its important role in aiding the function of the mitochondria – the “power stations” of our cells. Yet, in this case, the dependency is indirect. Adenosylcobalamin is part of the enzyme methylmalonyl-CoA mutase, which is involved in the conversion of methylmalonyl-CoA to succinyl-CoA. Methylmalonyl-CoA, in turn, is formed from propionyl-CoA in a previous conversion step – a step which requires biotin and magnesium (1). If biotin is deficient the situation can arise that, even though there is clearly enough adenosylcobalamin available, it remains useless because its reaction partners cannot be formed. Consequently, the symptoms of B12 deficiency occur, even though the blood levels of the vitamin remain normal. Here, an MMA urine test will show a B12 deficiency – even though this is not the case. Taking vitamin B12 supplements here would also not bring an end to the corresponding symptoms, since the B12 simply remains ineffective due to the biotin deficiency. Biotin is very sensitive to free radicals, so taking additional biotin is necessary in cases of stress, high-performance sport and disease. The absorption of vitamin B12 in the intestines via the intrinsic factor (IF) is a process dependent on calcium. When calcium is deficient, this absorption process becomes extremely restricted, which can lead to a slight vitamin B12 deficiency. This is demonstrated in patients who are taking the diabetes medicine metformin, which lowers the calcium level in the intestine to such an extent that many patients develop B12 deficiency. As studies have shown, however, this can be offset by a simultaneous administration of vitamin B12 and calcium (2). As a result of poor eating habits, many people today suffer from over-acidification. This means that the majority of a person’s calcium intake is used to neutralise this acid. When over-acidification in the intestines is severe, it can lead to B12 absorption problems. This furthers the general recommendation for an alkaline diet. Vitamin D deficiency can also lead to a calcium deficiency, even if the body tries to account for low calcium levels by extracting calcium from the bones. This can be particularly critical if a vitamin D deficiency coincides with over-acidification. In this case, as well as in other situations, it is sensible to take B12 supplements with calcium, in order to optimise the absorption rate via intrinsic factor (IF). Here, the organic calcium salts (calcium citrate, -gluconate and -lactate) are preferable to the poorly absorbed calcium carbonate. A further interaction concerns the conversion of vitamin B12 into its bioactive coenzyme form: the body can only use the B12 forms methylcobalamin and adenosylcobalamin directly, whilst all other forms of vitamin B12 must first be converted in the body. The conversion steps involved in this are dependent on the vitamins B2 (riboflavin) and B3 (niacin) (3). If a patient is being treated with high doses of cyanocobalamin or hydroxocobalamin, it can therefore be useful to take B2 and B3 as well, or ensure they are adequately provided through the diet. This article highlights just how sensitive the interdependent biochemical balance of the body is. A healthy, alkaline diet that is rich in raw foods will prevent most nutritional deficiencies from occurring. Stress, disease and environmental toxins however can lead to a range of deficiencies. If vitamin B12 treatment does not produce the desired results, it could be due to one of the interactions listed above. In any case, a combination of supplements is a sensible way to ensure the whole vitamin B active complex is covered and thus to ensure the optimal absorption and utilisation of these key vitamins. E.R. Stadtman, P. Overath, H. Eggerer, F. Lynen, The role of biotin and vitamin B12 coenzyme in propionate metabolism, Biochemical and Biophysical Research Communications, Volume 2, Issue 1, January 1960, Pages 1-7, ISSN 0006-291X, http://dx.doi.org/10.1016/0006-291X(60)90252-7. Bauman WA, Shaw S, Jayatilleke E, Spungen AM, Herbert V. Increased intake of calcium reverses vitamin B12 malabsorption induced by metformin. Diabetes Care. 2000 Sep;23(9):1227-31. PubMed PMID: 10977010.